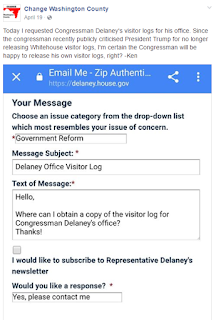 WASHINGTON, DC - Originally requested on April 19, 2017 in response to Congressman Delaney's statement on the Whitehouse not disclosing Visitor Logs, Congressman Delaney's staff has failed to respond within 30 days to a request for the Congressman's own logs. This failure to respond is quite hypocritical of the congressman, who claims to be a supporter of government transparency, but fails to disclose in a timely manner the same visitor logs which the White House is keeping secret. Delaney's failure to disclose his own logs further display his complete disregard for his constituents, and his insistence on simply towing the party line. As a reminder, Delaney only became congressman after Democrat governor Martin O'Malley gerrymandered Maryland's 6th Congressional District, which is probably only slightly better than Maryland's 3rd Congressional District. 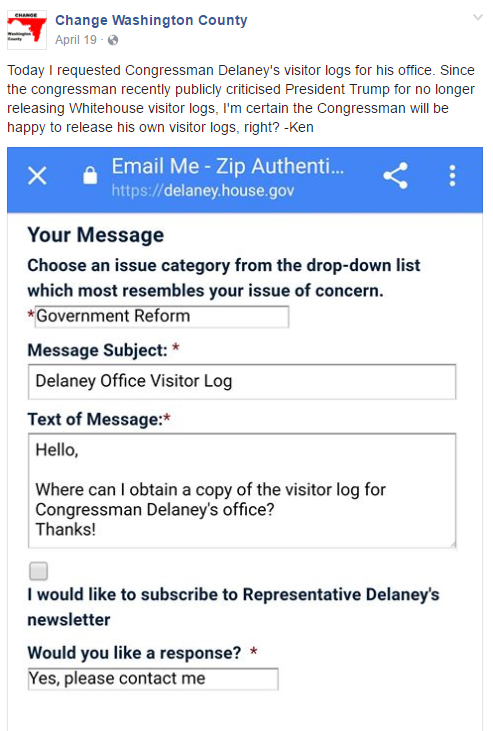 So I ask you, Congressman Delaney, what are YOU trying to hide? Ken is the editor of the WashCo Chronicle. Copyright © 2016-2019 Ken Buckler. Posts property of the submitting author, used with permission. Simple theme. Powered by Blogger.